After gathering all the pieces of the puzzle together, I'm now convinced that the James born to William Henry Reagan and Margaret Cunard on Oct. 23, 1820, in Blount County, Tenn., is James C. Reagan, my great-great-grandfather. Definitive proof, however, is still out there somewhere ... probably in Missouri. My James C. Reagan was born in Tennessee in 1820. The 1850 census of Navarro County, Texas, confirms that fact. The death notice from the same county shows he died in June 1870 at the age of 50. All that math adds up. And, William Henry Reagan's James is the ONLY one I can find born in 1820 in Tennessee ... or anywhere. I traced the path of several Reagans from Tennessee to Texas via Alabama and Missouri. It's evident that John Reagan -- William Henry Reagan's father -- moved his clan to Missouri. John died in Dade County, Missouri, on Nov. 13, 1843, at the age of 77.
brothers, John Black Reagan (b. 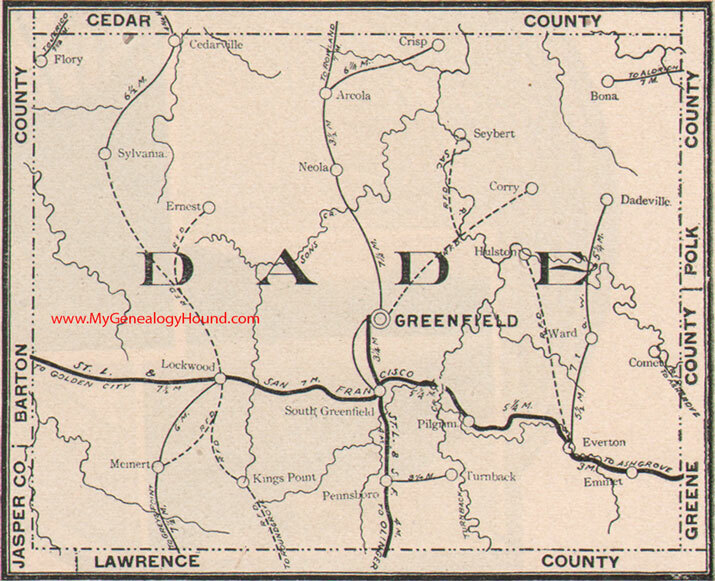 1814), in the 1850 Dade County census (see more below). born in Missouri (that would've been 1837). William Henry Reagan died in Dade County sometime before 1850, and Margaret died on Jan. 8, 1846, in Dade County. So, William Henry and his family made the trek to Missouri along with his father and at least two brothers. Also interesting to note: the 1850 census shows some of WiIliam and Margaret's children moved in with John Black Reagan ... specifically, William, 10, and twins Joseph and Charles, aged 8. It's evident that part of the clan continued on to Texas in the 1839-41 time frame, including Ahimaaz Reagan -- brother to John and uncle to William Henry Reagan. My James, 20 and ready to set out on his own, must have joined the Texas-bound bunch. Those Reagans must have first settled in Cass County, Texas. Ahimaaz died in Cass County in 1842.